Egypt's Islamist government teetered on the brink Monday in the wake of stunning weekend protests against Muslim Brotherhood rule. "Theocracy failed here," Egyptian blogger Mahmoud Salem, also known as "Sandmonkey," wrote in a Twitter post Monday. Sixteen people were killed and hundreds were injured during weekend protests that reportedly drew millions of Egyptians to the streets. Many estimated that the protests were larger than the 2011 demonstrations that forced dictator Hosni Mubarak from power. Numerous media accounts describe the broad demographic base of the protesters, from young women to old men, from liberal secularists to conservative Muslims. Several deaths took place when Muslim Brotherhood members opened fire on demonstrators who attacked, set on fire or looted Brotherhood offices. Four cabinet ministers – over tourism, parliamentary affairs, environment and communications – resigned from the government Monday in support of the protesters. Opposition organizers, calling themselves the June 30 Front, are asking demonstrators to wage a campaign of civil disobedience until President Mohamed Morsi resigns, just one year into his four-year term. That includes a continuation of protests, a general strike and other actions. More ominously, the Egyptian army gave Morsi a 48-hour ultimatum to negotiate some kind of resolution with the opposition or face what could amount to a coup, as the military promises to "announce a future roadmap and measures to oversee its implementation." The masses in Tahrir Square – predominantly Muslim and including many who previously had supported Morsi – roared with approval Monday when army helicopters trailing Egyptian flags flew past. But a Morsi aide told The Guardian that the army wouldn't be able to carry out a coup without Washington's approval. "The aide's comments implied that the regime was hopeful of continued American support," the newspaper report said. "They also suggested the presidency was banking on the likelihood that the military would not risk upsetting America, which provides it with significant funding." Faced with this historic outpouring of discontent, the best President Obama could muster Monday was a tepid call for "restraint." There was no statement of support for the protesters, but Obama did make a point of saying Morsi had been democratically elected. "There's more work to be done to create the conditions in which everybody feels that their voices are heard, and that the government is responsive and truly representative," he said. The president's comments expose a fatal misunderstanding of the Muslim Brotherhood's totalitarian doctrine. The Brotherhood has no interest in being democratic or pluralistic. The very basis of its existence is to impose Sharia and strict Islamic law upon everyone in Egypt as the first step of establishing a global caliphate. In a rare moment of candor, two top Brotherhood spokesmen said as much last year. In a speech, Supreme Guide Mohammed Badie reminded followers of the Brotherhood's original agenda laid out by founder Hassan al-Banna. "It begins with the reform of the individual and then to start building the family and society, then the government; then the rightly guided caliphate, then instructing the world; instructing guidance, wisdom, truth and justice." That same fatal misunderstanding was exhibited two weeks when the White House hosted a radical Muslim Brotherhood cleric. Abdullah Bin Bayyah received high-level access even though he is a senior official of a Muslim Brotherhood-affiliated group that had issued a fatwa calling for the killing of American soldiers in Afghanistan and has routinely supported Hamas terrorists against Israel. The president can't say he wasn't warned about the hazards of Brotherhood rule. Administration officials repeatedly have ignored concerns that, despite its warm assurances to the contrary, the Brotherhood would not govern democratically. After a power grab last fall neutered the Egyptian judiciary, the Obama administration issued similarly half-hearted statements. Morsi and his fellow Islamists rammed through a new constitution which sparked international concern for women's and minority rights. Analysts at that time expressed concern the power grab pushed Egypt closer to civil war. Egyptians who now demand that Morsi and the Brotherhood leave don't seem to feel part of a representative government. Morsi has done little to resolve the country's economic crisis, as infrastructure breaks down and resources become scarce. Instead, the group was seen doing more to consolidate its own power and impose religious law. As we have reported, Coptic Christians in Egypt have faced constant threats and injustices. Morsi has stacked the government with fellow Islamists, including a recent attempt to appoint a hardline Islamist tied to a terrorist group as governor over Luxor, which has a tourist-driven economy and was the site of a slaughter on tourists in the 1980s. Elections also do not guarantee stability, writes Eric Trager of the Washington Institute on Near East Policy. Mohamed Morsi is "now president in name only." The United States needs to gear its policy toward a longer vision and try to limit the damage done to the state by the ongoing turmoil. Protesters tried to issue a similar message Sunday. They chanted against the United States and carried signs criticizing Obama and U.S. Ambassador Anne Patterson. Arabic media reports claim Patterson held secret meetings with Brotherhood deputy leader Khairat al-Shater last week. 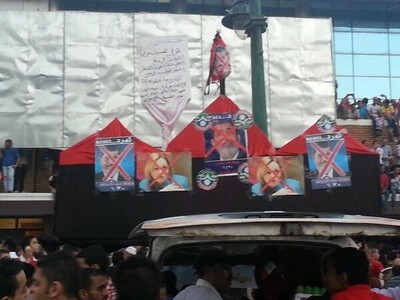 And many protesters carried signs with Patterson's image crossed out alongside Morsi, or with critical comments. An Egyptian blogger who calls himself "the Big Pharaoh," wondered "Will the State Dept. 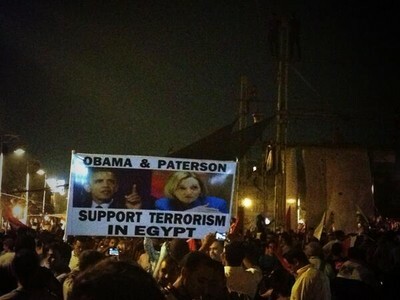 fire Anne Patterson for all the inaccurate Egypt reports she was sending back to Washington?" The Brotherhood had a distinct advantage going into last year's elections. It was the only organized, relatively harmonious political movement standing after Mubarak fell. Even with that edge, allegations of fraud followed Morsi's narrow victory. Pleas to delay elections to give others time to organize largely were ignored and the Brotherhood cruised to parliamentary victories to go along with Morsi's presidential election. Now, a grass-roots opposition group called "Tamarod" – or "Rebel" claims to have 22 million signatures on a petition demanding Morsi step down and allow new elections. Morsi won 13 million votes in last year's election. In 2011, the United States saw the depth of Egypt's unrest and called on Hosni Mubarak to resign. More people made the same request of Morsi on Sunday, and now the Egyptian military is poised to intervene. The Obama administration's hesitancy this time serves only to alienate whatever Egyptian government follows the Muslim Brotherhood. The answer is Yes the Obama Administration does appear to be the Mustlim Brotherhood's biggest supporter and Allie. Ayman Al Zawahiri is/was a Muslim Brotherhood member and was inprisoned in Egypt, before joining Al Qaida. Ann Patterson is evil and criminal .She is support Terrorism against Egypt by advocate her DOGS of MUSLIM Bro'hood .She was annoyed after the revolution of 30/6 threatened her friends Islamic Salafy .Patterson go to the hill. Does the USA administration, the biggest ally to the moslem brother hood is the same group from which Omar and Ayman elzawahry are from. Just asking, since I am totally confused. By the way I am egyptian and moslem, so I am not anti moslems or egyptian, instead just one of the millions of egyptian who are moslem by peacefull.